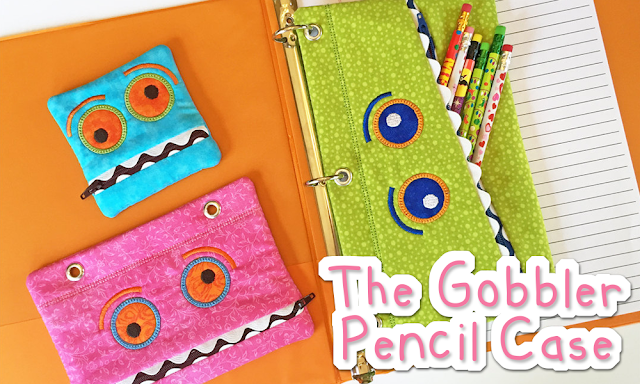 I call this pencil­eating zippered case The Gobbler. It's just the right size to hold a bunch of pencils, pens, ­ plus an eraser, and a sharpener. This is an easy sewing ­ project, consisting of only straight lines. The hardest part is getting the fabric facing the right direction, so pay special attention to those parts of the instructions. Lay the wider rectangle in the outside fabric face up on a flat surface. Lay the zipper face down over the fabric. Make sure the teeth of the zipper (not the zipper tape) are centered over the rectangle. Line the edge of the zipper tape up with the edge of the fabric and pin in place. Lay the wider rectangle in the lining fabric face down over the rectangle from Step 1, with the zipper sandwiched between the two layers of fabric. Pin or clip the layers in place. Sew the three layers together (outer rectangle, lining rectangle and zipper) getting as close to the teeth of the zipper as possible. You'll want to stop partway along the seam to move the zipper pull out of your way. If you have a zipper foot, that will let you get very close to the teeth. If you don't have a zipper foot, just get as close as you can. You'll have a little more zipper tape showing in the finished pouch and it will be fine. Flip the fabric rectangles right side out and press. One the right side of the zipper (where the pull is) you should have the right side of the outer fabric showing. If you flip the whole thing over you should have the right side of the lining fabric showing. Repeat Steps 1­-4 with the narrower fabric rectangles and the other side of the zipper for the bottom of the face. Remember ­ the right side of the outer fabric should be facing the right side of the zipper and the right side of the lining fabric when you sew. You're done with the front of the pouch. Sew on some fun features! I stacked black buttons on top of larger blue buttons for the eyes and sewed on tiny black buttons for the nostrils. Play around and have fun with these! Add one giant button to make a cyclops. Embroider on some eyebrows. Skip the nostrils. Make it your own! You'll be sewing all around the outside of the pouch using 1/2" seam allowance ­ so make sure to take that into account when you position your eyes and other features. Flip the lining piece out of the way so you're only sewing through the outer fabric. Measure the finished piece. It should be 10 inches wide, but the height will vary depending on the chunkiness of the zipper you're using, and how close to the teeth you were able to stitch. Mine was 10" wide and 4 7/8" tall. Use the measurements of your finished face to cut two back pouch pieces to match it. Cut one from the outer fabric and one from the lining fabric. For the hair / spikes, we'll be making some prairie points. It's really easy ­ just folding! Fold one of your squares in half along the diagonal. Press. Now fold it in half again, so that all the raw edges are lined up along the longest edge of the triangle. Press. Done! Repeat for the other four squares. Ready to put it all together? Pin the prairie points along the top edge of the face. I start by folding the face in half to find the center. Pin the center point in place first, then pin the two at the edges, then center the last two between them. All the raw edges of the prairie points should be lined up with the raw edges of the outer and lining fabrics. Unzip the zipper mouth at least part way. This is very important! If you forget, you won't be able to turn your pouch right side out after the next step! Lay the last outer fabric rectangle (the one you cut in Step 7) face down over the face, with the prairie points sandwiched between the two layers. Lay the last lining rectangle face up over the outer fabric. Pin all the layers together all the way around the edges. Leave about 1/4" seam allowance. Turn the pouch right side out and poke out the corners with a chopstick. You're done! See how cute the contrasting lining inside the mouth looks? Did you have fun?